We hope to return to the rental market Late-season 2019. At that time you will experience everything in brand new condition! Please email Carolyn's gmail address: vacationrental302cs for updates. 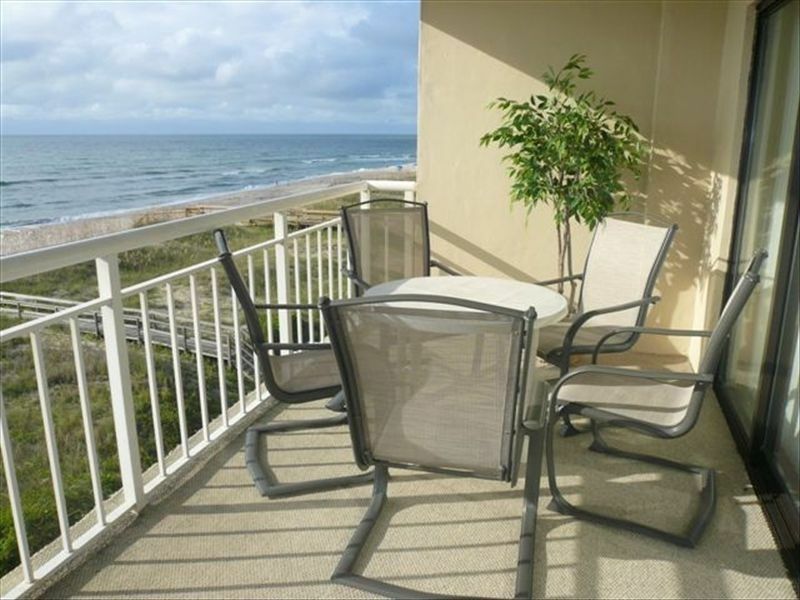 Enjoy the view from this oceanfront unit located in downtown Carolina Beach. Carolina Surf units are the most sought after oceanfront condos on Carolina Beach because of our walkable location and outstanding views. Our third-floor unit has a key-less entry custom coded for your security and convenience. The large private balcony is accessible from both the living room and the master bedroom. We want to share with you all the comforts of our oceanfront home and are committed to keeping our property updated and maintained in top condition to provide you with the very best experience during your vacation stay! New furniture, New appliances & New paint! Our building is a four-story, concrete and steel constructed building complete with a Security Coded Elevator, trash chutes (located on the South end of the building in the stair wells) on each floor, and covered parking. With only 28 units located on a 220-foot oceanfront lot, you will never feel crowded. The pool is located on the oceanfront side of the building. All parking is located underneath the building, so the car is much cooler during the summer months. You will find TVs in the living room and in each bedroom. High Speed Internet Service is free. Relax in the master bedroom with a wonderful view of the ocean from the bed, access to the balcony and the privacy of a jetted garden tub. All three bedrooms have a Queen size bed. Two additional twin beds are provided: one in a bedroom as a pull out trundle and the other in the living room in a pull out love seat. Each bedroom has a bathroom. Visit the North Carolina aquarium located on the south end of the Island, or take a ferry ride to Southport for a day trip. There are also many top-ranked golf courses nearby, and historic Wilmington is only 20 minutes away. For more ideas of where to eat and what to do during your stay, we provide a welcome book with menus and sightseeing ideas at the condo. If you’re looking for a relaxed beach and a location that is walking distance from The Boardwalk, the Lake, Restaurants and Shops, look no further. These condos book up very quickly, so reserve the week you want before it’s too late. Our family has been vacationing in Carolina Beach for generations and this beautiful condo has brought a lot of joy to our family over the years - parents, grandparents and children. It is our privilege to share our home with you through VRBO and we want you to have the very best experience vacationing in Carolina Beach. When you arrive you will find a welcome book providing useful information specific to our condo (like wifi passwords and important contact info). If you're not familiar with Carolina Beach, we have ideas of what to do in the area along with dining suggestions and sample menus. For your convenience we provide a starter supply of paper products (paper towels, toilet paper, coffee filters) dishwasher detergent, laundry soap and hand soap. For those that like to cook you will find our kitchen well stocked with everything you'll need to prepare meals and serve a large group along with spices and basic pantry items. Things are organized so you can easily find what you want, and housekeeping pays close attention to details so you can rest assured you'll arrive to a clean and relaxing place for your stay. Listen to the surf outside your door, view the spectacular scenery and Enjoy your well deserved break at Carolina Surf, a prime location in Carolina Beach. Discounted rates for sheets and towels provided by T & J Linen Rentals. Ask owner for rates and contact information. Is your party larger than 6? Contact owner for referral to other available condos at Carolina Surf if your group is interested in renting a second condo in the same building. We had a wonderful week at the beach. The condo was spacious and central to everything. The view from the balcony was perfect. Owner was very helpful in answering all questions. Awesome condo in awesome location. We had the most relaxing vacation in recent memory. The 3 bedrooms were ample space for our entire family with a wonderful view of the ocean especially for a new mom whose 1 month old is not quite ready for the beach. Close walk to the boardwalk for evening strolls and nightlife. Couldn't have been more happy with the place and the responsive owners. Thanks so much for everything. You can park your car and walk to restaurants, ice cream. It can get crowded on week-ends but the strand is nice and flat so you can spread out. The condo is beautifully maintained, well-stocked with everything you need. had a wonderful time, condo is spotless and have no complaints. This condo is probably one of the nicest we have stayed in. Everything was very clean and in working order. Just a block from the Carolina Beach boardwalk which has food, shopping and amusement activities. It's located right on the ocean with a great view from the roomy, newly carpeted porch.We will definitely stay here again!! second time staying in unit 302. loved everything about our visit . a must stay. Sales tax is charged on rental fee only. Departure cleaning and reservation fee are tax exempt. Online processing of your reservation is available using VISA, MasterCard, Discover or E-check. If you prefer, personal checks can be sent through the mail 30 days in advance of your reservation.